Please write the most common/general/appropriate term (to be used as a tag) for the activity described below in an answer. There is this one outdoorsy activity that we had some questions on, but that does not have a dedicated tag. I would like to use this tag, but as a non-native English speaker I am unsure what is the most common/general/appropriate term. There probably is one "correct" answer, at least in German there is. So let me describe what I mean (well it's in the title and probably obvious, so this might be too long). The activity is simple: Go up a mountain with skis on your feet (meaning "motorised transportation" like lifts/helicopters/... may be used for initial access, but are not the main part of the ascent) and then descend them again. The equipment is a ski similar to a piste ski but normally lighter and wider. 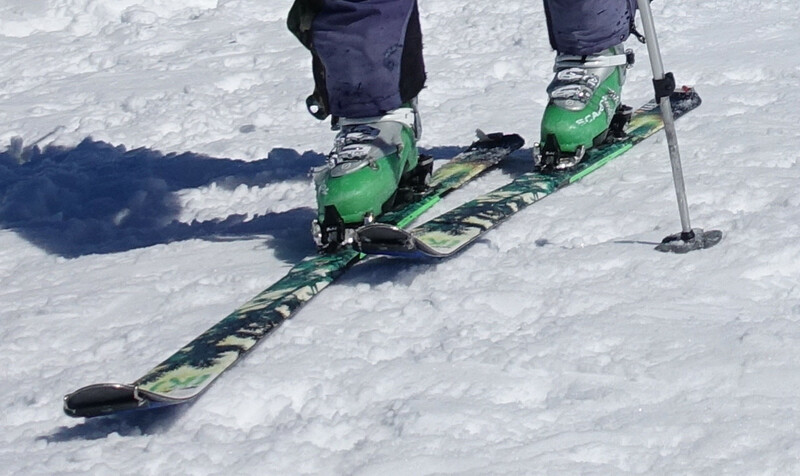 The binding has some sort of mechanism to either fixate the shoe on the ski totally (descent) or only at the tip, such that the foot can rotate forward (ascent). To not slip backwards you put skins on the bottom of the skis. The reason I am asking is that I have two terms in mind, one is more or less the equivalent to German (so I would naturally pick that), but the other might be the "correct" one (or there is yet another). As per @Sue's request here is a picture of the gear used. Well it isn't the best representation, but you can see the the bindings, lifting of the left heel (just about) and you can just make out the skins at the front (and clips at the back). Well, that's what I found when quickly looking through parts of my pictures, apparently I don't usually focus on gear. but as mentioned, that is based on the undisputed term used in German which is "Skitouren". Backcountry skiing is the term I use. Ski touring is a form of backcountry skiing where both uphill and downhill travel are possible without needing to remove skis. Typically touring is done off-piste and outside of ski resorts, and may extend over a period of more than one day. I Think the more general English term would be cross country skiing which has ~36M hits, with the description. Skis, poles, boots, bindings. Cross-country skiing is a form of skiing where skiers rely on their own locomotion to move across snow-covered terrain, rather than using ski lifts or other forms of assistance. While backcountry skiing with ~2M hits is also an option, It includes backcountry skiing helicopter assisted events. Which your comments indicate you want to exclude. Backcountry skiing (US), also called off-piste (Europe) or out-of-area, is skiing in the backcountry on unmarked or unpatrolled areas either inside or outside a ski resort's boundaries. This contrasts with alpine skiing which is typically done on groomed trails benefiting from a ski patrol.